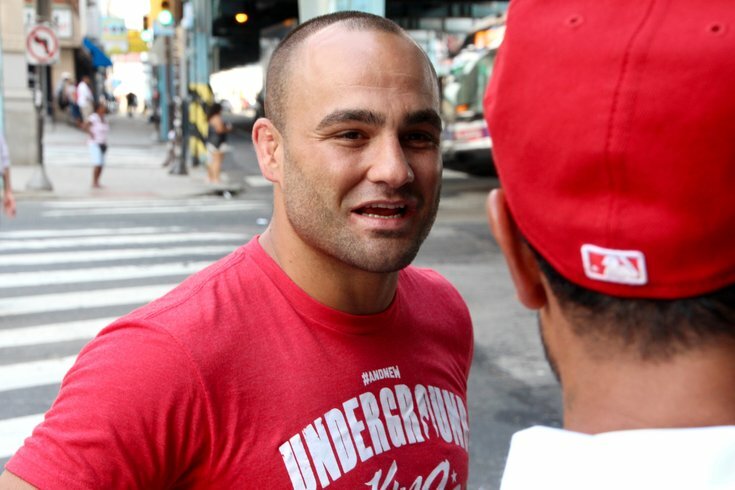 Kensington native Eddie Alvarez, who won the UFC lightweight title last summer but lost his belt six months later when he was knocked out by Conor McGregor, returns to the octagon on Saturday night in Dallas to face Dustin Poirier (21-5) as part of the undercard at UFC 211. And although the result of his last fight saw his worst fears realized – and left him in tears on the drive home from Madison Square Garden – Alvarez (28-5) says it was a learning experience. "You know that nightmare where you wake up in a classroom naked?" he recently told Ed Barkowitz of The Philadelphia Daily News. "Well, I woke up in a classroom naked. It happened to me. My biggest fear as a fighter is to be knocked out in front of millions of people. But after it actually happened, there's this calmness about you that says everything is OK. That's what I learned. If your worst fear can come true and everything can still be OK, then there's really not much to fear at all." PhillyVoice caught up with Alvarez earlier this week (story coming Thursday), but on Wednesday, the 33-year-old North Catholic grad took over the UFC Twitter account for a Q&A with fans ahead of his first bout since losing his title. Alvarez-Poirier will air on FX (coverage begins at 8 p.m.), followed the UFC 211 main card on Pay-Per-View (starting at 10 p.m.). Click here for a list of locations near you that will be showing UFC 211.